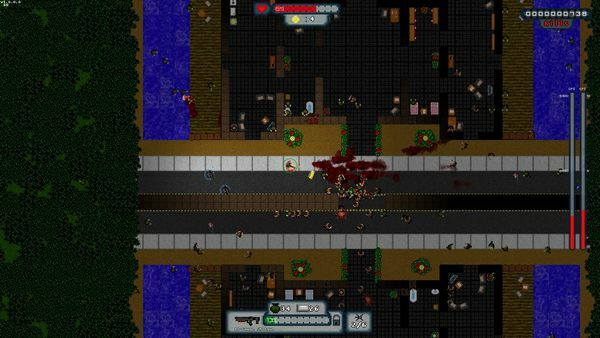 Because 8,999 zombies would never be enough… Survive the twin-stick shooter zombie apocalypse, in a game that has simplicity as both its strength and weakness. I think as a species we have now democratically voted “zombie apocalypse” as the way the human species will go out. They’re everywhere – in movies, books, comics, games… and we keep coming back for more. So seeking to raise our daily zombie quota is Over 9000 Zombies! by one-man developer Loren Lemcke. … and yes, it is playing on the “Over 9000″ meme in that title… Relax though – that’s the only place it does. 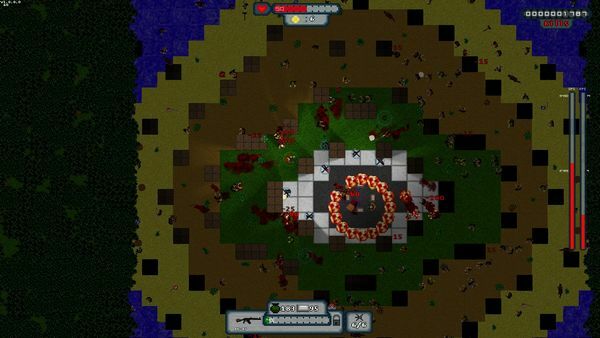 Over 9000 Zombies! 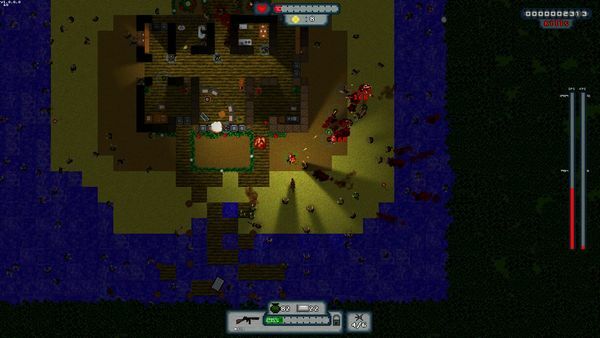 (O9KZ) is a twin-stick shooter (also playable with WASD and the mouse to free-aim), putting you in the resourceful boots of a survivor who would like to keep on surviving. This is made awkward by the large waves of zombies that would sooner snack on him, who are ideally deterred with appropriate levels of violence. You begin carrying a pistol with an infinite number of reloads – although there are pauses in firing for those reloads to happen. As you take down zombies, zombie dogs, zombie eyeballs, zombie crows, and – I’m still getting my head round this last one – zombie crabs you work towards your next weapon, usually providing upgrades in either damage or fire rate. It’s a simple system, and one handled nicely – each weapon does feel different, with increased damage feeling appropriately powerful and wider hit boxes (with a shotgun or spraying machine gun bullets) clearing crowds. So far, so straightforward. However, O9KZ throws a twist into the mix, as our survivor can scavenge scrap metal that is sometimes dropped and deploy up to six automated gun turrets to add to the carnage. These come in a range of flavours and costs, from basic guns to incendiary grenade launchers… and if you feel you’ve got enough fire-power in place, scrap can also be spent setting up barricades, slowing or redirecting the hordes before it gets torn down. At the end of each “day” – that is to say, each wave survived – you also get to choose one of four personal upgrade paths to improve. These are pretty straightforward – more health, more damage, more items scavenged, or more effective turrets – and whether you choose to specialise in a certain playstyle, or to broaden your abilities overall, you do feel the effect of these choices very quickly. … this essentially covers things. The thing is, O9KZ is a pretty straightforward concept, and within an hour you’ll probably have seen everything the game is offering. There in no legacy play, so what happens within a game is a self-enclosed economy of looting, shooting and building; and when you die you start entirely from scratch again. But I can’t say this is a fault exactly – there is an extremely fun game here. Having seen what is there is not the same as not wanting to see it again, and it quickly became a “just one more go” experience, trying for increased personal damage with different guns, or alternative combinations of turrets. As far as a simple concept quickly grasped goes, it’s great. But this simplicity does also go both ways. There is a sense of things being stripped back as far as presentation goes too – graphically the game is basic (if functionally efficient), our apocalypse is carried out to a minimal variety of tunes, and the game’s sound effects sound more like something from an 80s arcade space game… somehow blasting away with an assault rifle feels rather puny with “pew-pew!” sounds, regardless of damage done. There is also a lack of decent feedback on your and their health – sometimes you can run through a group of zombies and come out unharmed; sometimes you’ll get mauled, but unless you die you won’t know if you were hit without checking your health bar. On the flip side, you know you’re damaging zombies thanks to damage numbers appearing over their heads; but these numbers don’t reflect total health. With a regular enemy, usually dead in less than a second regardless of weapon, that’s fine… but the game sometimes has the zombie equivalent of a guest appearance, throwing Napoleon, Tchaikovsky or other historical figures in – and they take a lot of damage. Some form of health gauge would be fitting, and feels absent. The game comes with a level editor, another example of simple as both good and bad. The minimal number of terrain choices – and the hard edges where they join each other – make you realise how simple the game is underneath everything. It can also be exploitable if you want to build a mass of walls to cover a particular direction and make the environment heavily in your favour. However, if you do devise a layout you’re especially happy with, you can upload it to the Steam Workshop, and browse those by others to play yourself. Finally, there is multiplayer for up to four people – either local or online. There are some adjustments here – the six turret maximum in single player remains as an overall total, while the weapon unlock progress is shared across all players. In local play, invisible borders are used to keep all the players on screen with each other, which isn’t a problem with online play; however, in my attempts at playing online there were significant lag issues – although in fairness I was unable to determine if that was down to the game, the hosts or me as a joining player. Over 9,000 Zombies! is a fun, simple concept – easily grasped and encourages replaying with different combinations of skills, weapons and turret support. However, it is also very simple graphically, aurally and in terms of action feedback, in ways that somewhat diminish the overall experience.